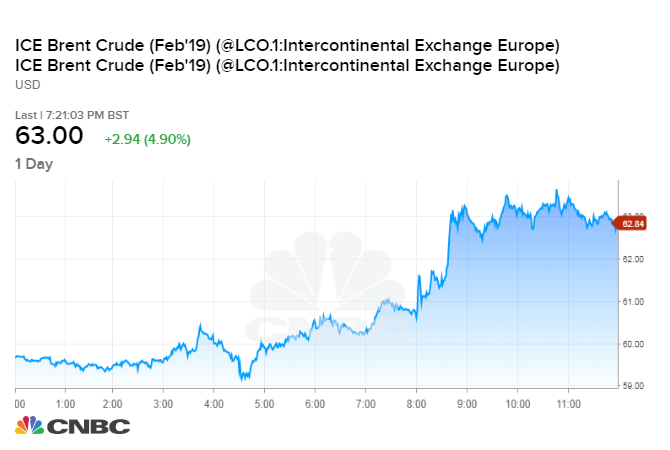 Oil prices jump after OPEC and its allies reach an agreement to slash production for the first six months of 2019. OPEC producers agreed to cut output by 800,000 barrels per day, while allied nations including Russia will reduce production by 400,000 bpd. The combined cut of 1.2 million bpd is in line with expectations and will take effect in January. Oil prices surged higher on Friday after OPEC, Russia and several other producers reached an agreement to cut output next year in order to boost the market. Brent crude, the international benchmark for oil prices, rose $1.61, or 2.7 percent, to $61.67 a barrel. Brent earlier rose more than 5 percent to $63.73. U.S. West Texas Intermediate crude futures ended Friday’s session up $1.12, or 2.2 percent, at $52.61 per barrel, off a session high of $54.22.